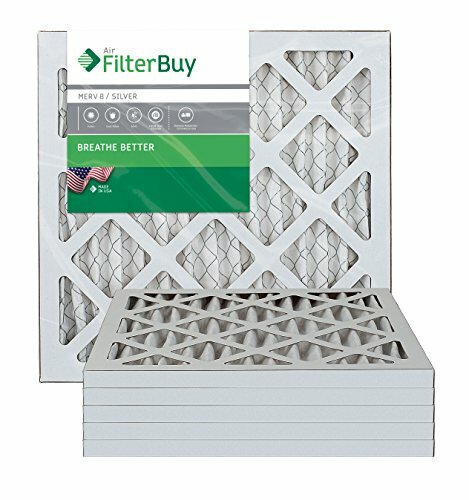 The AFB Silver MERV 8 furnace / air filter is the most commonly purchased replacement filter by AirFilterBuy. The AFB Silver filters pollen, mold, dust mites, and other particles that are up to the size of 'pudding mix' that you might buy at the grocery store. We recommend the AFB Silver Merv 8 filter for basic home and residential use. It will protect your AC / furnace system, while offering adequate filtration to keep your home dust and pollen free. Whenever you are choosing an air filter, make sure that you compare the nominal and actual size of the furnace filter that you are replacing. In this case, the ‘nominal’ size of the filter is 14x14x1 while the ‘actual’ size of the filter is 13.75 x 13.75. Generally, the nominal size is rounded and in bigger print while the actual size is in smaller print and in parenthesis to the side. The AFB Silver MERV 8 filter is designed to last 3 months, or 3 times the average fiberglass filter. The filters ship directly from the manufacturer to your doorstep, allowing AFB the ability to offer a premium product at a reasonable price. 14x14x1 MERV 8 Pleated Air Filter for AC HVAC or Furnace (Pack of 6 Filters). AFB Silver MERV 8, comparable with MPR 300 / 600 (clean living and dust & pollen).